Here is a set of photographs from the one day trip me and Liku had done back in December last year (when I was at home for a week long vacation). It was fun:) When there are only two people in a ride, and add to it, that they were childhood friends, then the ride is ought to be fun:) Once the destination was decided, we took the roads we felt like, pulled over any time we saw something worth stopping for and no planning at all. The only objective was to reach home before the sun goes down! lol. Just like the school days:p Recently while going through my pictures archive, I came across few photographs which reminded me that, 'this' impromptu trip hasn't yet made it to my diary. So without any further delay, sharing some of the places and memories below.. Awesome sunset and view:) Thanks to Liku, I could be in this pic. We had stopped near Pipili(www.pipilicrafts.com) to visit a temple. You can see few of the crafts on display behind me. [Update: 20/12/2016] I know it is a bit late but I think it should be alright, as you would get to see some beautiful images shot inside the temple, which we visited. Thanks to Google's reminder, showing me these images shot years ago:). So here they are, hope you like these. I enjoy seeing patterns, when with a camera. It's a good visualisation exercise as a photographer. Nope, they going parallel and most probably never met :| A sad romantic story, you see. Liku was a sport and agreed to pose for creating this urban+contemporary+industrial shot. The view once we stepped inside the main gate/entrance of the temple. Statues of Gods on each pillar were beautiful and very colourful. The central structure inside the temple compound wall nestled among the coconut trees. Ever since childhood, I always enjoyed the artwork inside temples. Though this one is a relatively new, still the trend exists. Beautiful sculptures on the pillars and I loved the ambience inside. The view of the beautiful courtyard. A hut with the backdrop of a beautiful sunset. 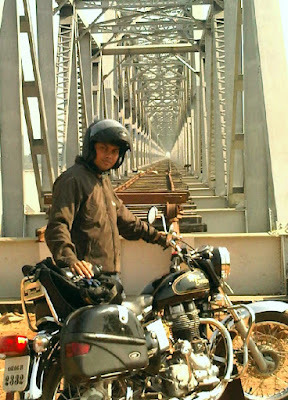 This if I remember correctly, is shot on our return, when we crossed this temple on the way back to Dhenkanal.